We have uncountable varieties of chaat’s originated in Indian street and katori chaat is one of them. 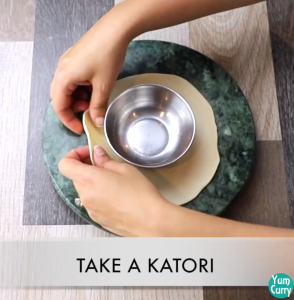 Katori mean a small basket or a bowl. 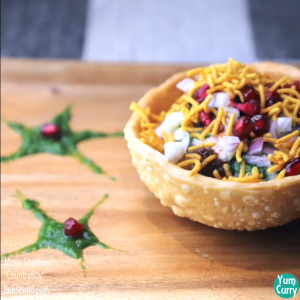 Katori chaat is a potpourri of lots of delicious flavour, taste and texture and it is serve in edible bowl. 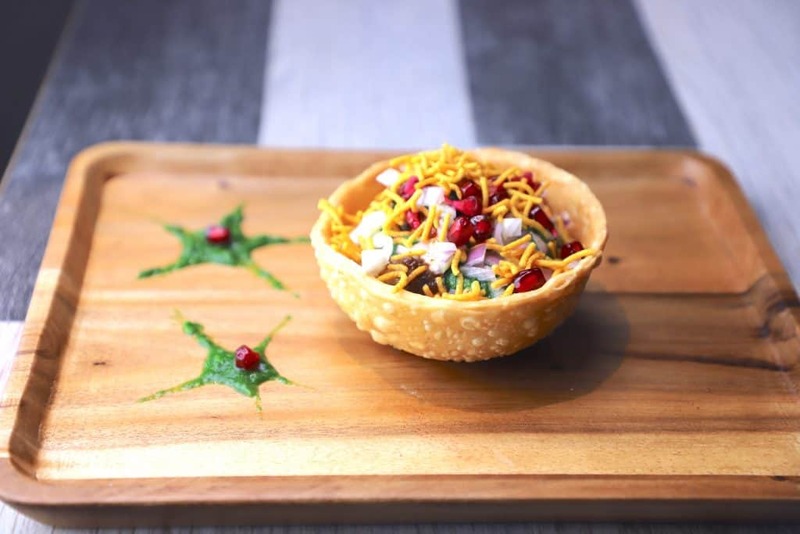 Generally we eat chaat in environment friendly bowl made with banana leaves, but katori chaat served in edible munching bowls and these bowls are great add on in the taste. So folks, are you bit tired of mundane chores, same dal roti, same vegetables and busy running errands weekends over weekends. Do you feel bit of chatpata taste today on your tongue or if you did not get time to hop over street foods for long time, and your tongue demands you treat her with something different?. Are you poised to spice up your snacks today?. I have brought you some of the best chaat from the street. Chaat is a Hindi word and it looks like potpourri of many many things. 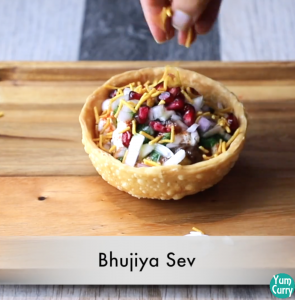 Mouthwatering, delicious, spicy, crispy, savoury and sweet, when all these flavours together bursting in your mouth what else it can be then chaat. There uncountable varieties of chaat available in the market, Aloo chaat(Potato chaat), Papadi chaat, kachori chaat, dahi chaat, samosa chaat. You can invent your own version by just combining your favourite ingredient. 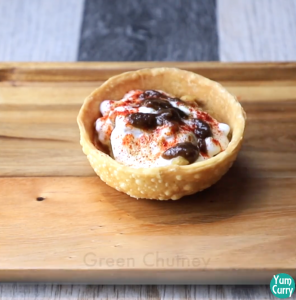 Some time it is boring to have sprouted moong beans and chana in to the breakfast, so why not give them a twist by adding common chaat ingredient and make you healthy breakfast delicious and tasty. This sassy food item is no more limited to road side stall. You will find huge varieties of chaat and other street food items in malls, which are good as street food and hygienic as well. Chaat is also served in wedding or other special occasion. 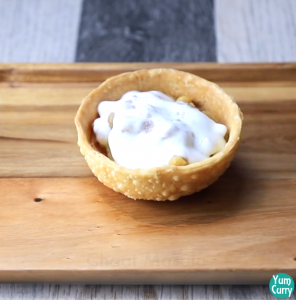 It is popular party snacks, katori chaat is perfect snacks for any house party. Chaat is my all time favourite evening time snack. You can easily find it on road side stalls at streets, it’s a purely street food. During shopping and outing, it is common to hit the road for having chaat. Chat is the combination of lots of spices, coriander, chili powder, tamarind chutney, green chutney, black salt, bhujiya sev, curd, onion, some of the common ingredient used in any chaat and the most important ingredient is chaat masala it is the mixture of cumin, black salt, black pepper, dried mango powder, dried ginger power, red chilli. I always keep chaat masala in my pantry, it can spice up any boring food. 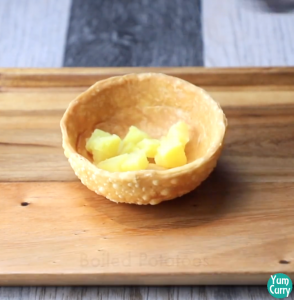 For making katori chaat a medium size of basket prepared with all purpose flour or potato, you can deep fried or bake baskets and then these baskets fill with lots of tangy, spicy, sweet, crispy ingredient. I am using all purpose flour for making basket or katori, making of katori is little tricky. I am using medium size bowl to make it. 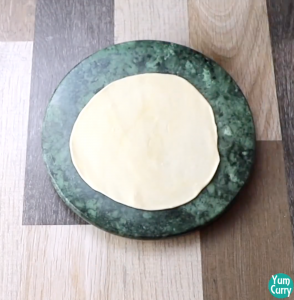 for making katori roll a thin circle with dough place a katori in the centre and wrap dough around katori, smooth the surface and trim off excess dough. Katori is ready for frying. Fry on medium heat until its turn light brown. 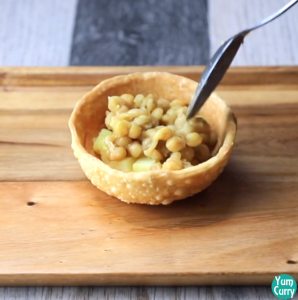 Top katori with potato, white peas, chutneys, spices and sev bhujiya. You can change filling and replace white peas with chickpeas, and adjust toppings according to your taste. You can replace white peas with chickpeas. You can prepare basket in advance and store in airtight jar. You can change filling according to your choice. Baskets can be baked instead of deep frying. checkout more snacks recipe masala peanut, chilli cheese sandwich, methi thepla, rava toast, dahi ke kabab, palak ke matar. Wash and soak 1 cup of white peas for 3 hours. Once they are soaked, drain the water. 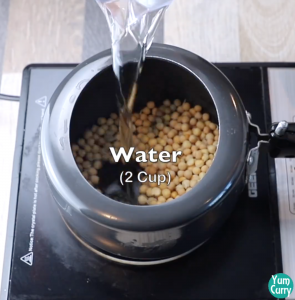 Add 2 cup of water in pressure cooker add soaked peas and 1 tsp salt. Pressure cook it on low medium heat. Turn off the stove after one whistle and let the pressure release. Remove the lid and check if the peas are cooked. For filling also keep boil potatos ready. 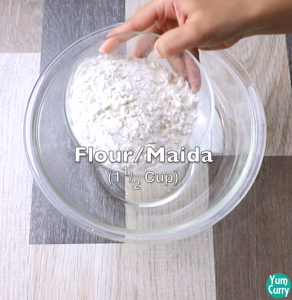 Add 1.5 cup all purpose flour(maida) in a mixing bowl. 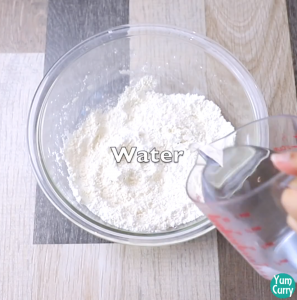 Add salt and oil, mix ingredients using hands. 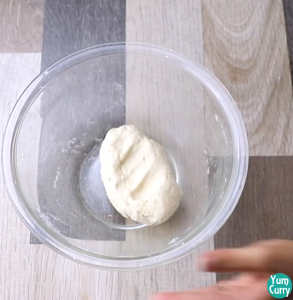 Add little water at a time and knead a stiff dough. apply some oil on dough and cover it with cloth. Leave it for 10 minutes. 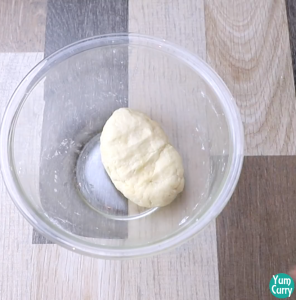 Take a small portion from the dough, roll between you palm and give it a round shape. Place a small bowl in to the centre of the circle. 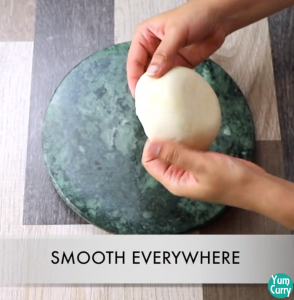 Start picking up edges and wrap dough around the bowl. With the help of finger gently smooth the surface. Using fork prick it all over( it avoid puffing up dough while frying). 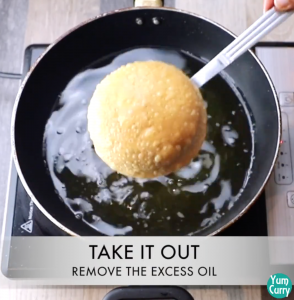 Heat oil in a pan, gently drop dough wrapped bowl in to the hot oil. Fry on medium heat, bowl will start leaving dough. when bowl completely separate, drain and take it out with help of tong. It can be hot so do not touch with hands. Continuously rotate it, until it turn light golden brown from all sides. 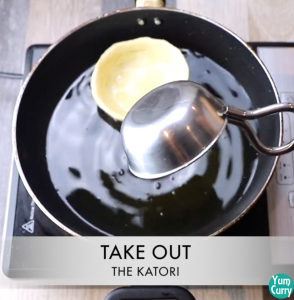 Take out katori to the kitchen towel to drain excess oil. Soak tamarind in to water for 5-10 minutes. when they turn soft deseed tamarind and boil in 1/2 cup of water on low heat for 10 minutes. Let it cool down. Mash tamarind and strain. Add sugar, red chilli and black salt to the strain tamarind paste. In a blender add coriander leaves, green chilli, ginger, mint leaves and salt. blend all ingredient in to a smooth paste. 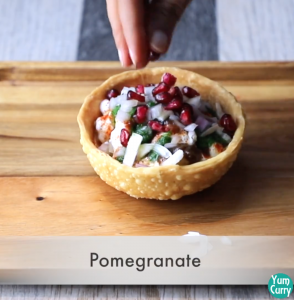 Start assembling chaat in to layers. Take katori add pieces of boiled potato, boiled peas and curd. 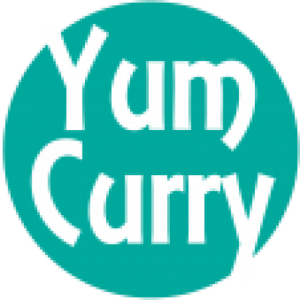 start adding spices like salt, black rock salt,chaat masala and chilli powder. Sprinkle some onion, pomegranate seeds and bhujya sev. Delicious Katori chaat is ready to enjoy. 1. 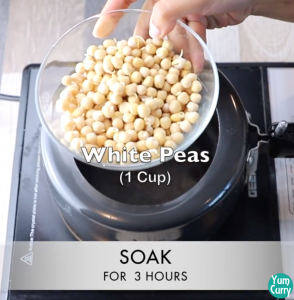 Wash and soak 1 cup of white peas for 3 hours. Once they are soaked, drain the water. 2. 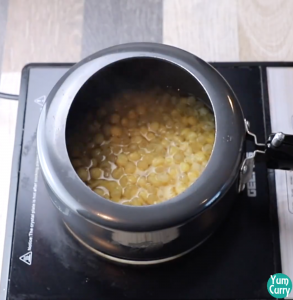 Add 2 cup of water in pressure cooker add soaked peas and 1 tsp salt. 3. Pressure cook on low medium heat. Turn off the stove after one whistle and let the pressure release. 4. Remove the lid and check if the peas are cooked. 5. Boil 2 medium size potato. 1. 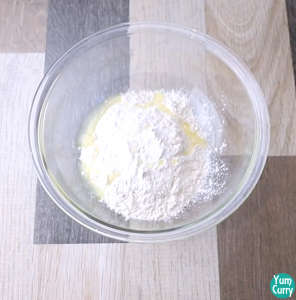 Add 1.5 cup all purpose flour(maida) in mixing bowl. 2. Add salt and oil, mix ingredient using hands. 3. Add little water at time and knead a stiff dough. 4. Apply some oil on dough and cover. Leave it for 10 minutes. 5. 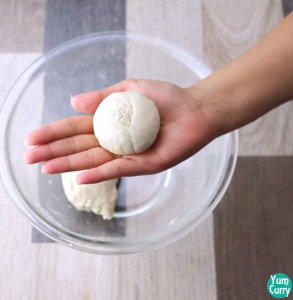 Take a small portion from the dough, roll between you palm and give it a round shape. 7. Place a small bowl in the centre of the circle. 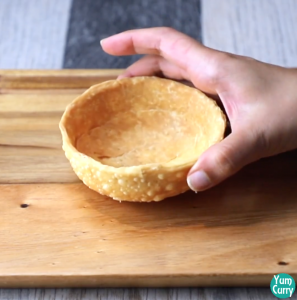 Start picking up edges and wrap dough around the bowl. 8. With the help of finger gently smooth the surface. 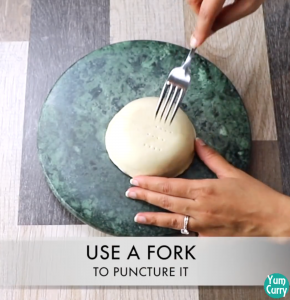 9.Using fork prick it all over( it avoid puffing up dough while frying). 10. 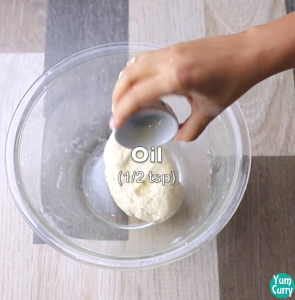 Heat oil in a pan, gently drop dough wrapped bowl in to the hot oil. 11. Fry on medium heat, bowl will start leaving the dough. 12. 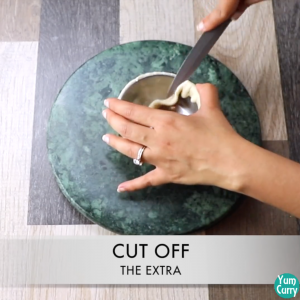 When bowl completely separate, drain and take it out with help of tong. Do not touch with hands. 13. Continuously rotate it, until turn light golden brown from all sides. 14. 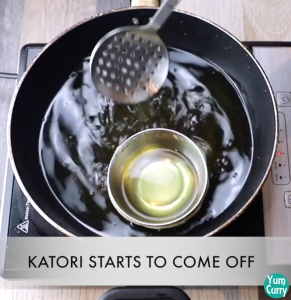 Take out katori to the kitchen towel to drain excess oil. Soak tamarind in to the water for 5-10 minutes. when they turn soft, deseed tamarind and boil in 1/2 cup of water on low heat for 10 minutes. Let it cool down. Mash tamarind and strain, add sugar, red chilli and black salt. In blender add coriander leaves, green chilli, ginger, mint leaves and salt. blend all ingredient in to a smooth paste. 1. 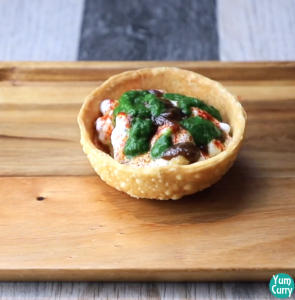 Start assembling chaat in to layers. Take katori add pieces of boiled potato. 2. Add boiled peas and curd. Add spices like salt, black rock salt,chaat masala and chilli powder. 4. Sprinkle some onion, pomegranate seeds and bhujya sev. 5. Delicious Katori chaat is ready to enjoy. Try this recipe at home for any upcoming occasion and please comment below how you liked it.